Volksparkstadion, also referred to as Hamburg Arena, got built on the site of the old stadium with the same name, but with the pitch turned 90 degrees. Building works started in July 1998, and as the old stadium was gradually demolished and replaced with the new one, HSV kept playing their home games at the stadium. 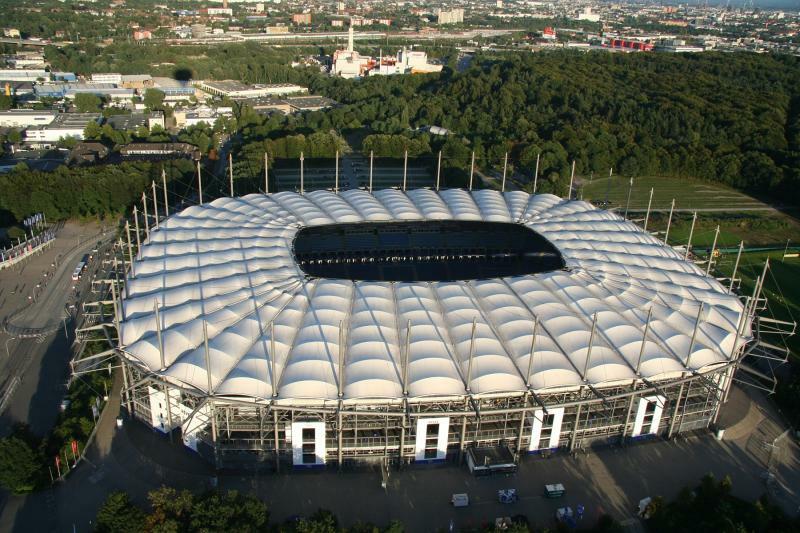 The new Volksparkstadion was completed in August 2000. It first received the sponsor name AOL Arena, which it kept until 2007, was renamed HSH Nordbank Arena between 2007 and 2010, and then received the sponsor name Imtech Arena until 2015. During the World Cup and other events where the sponsorname could not be used, the stadium went with the name Hamburg Arena. 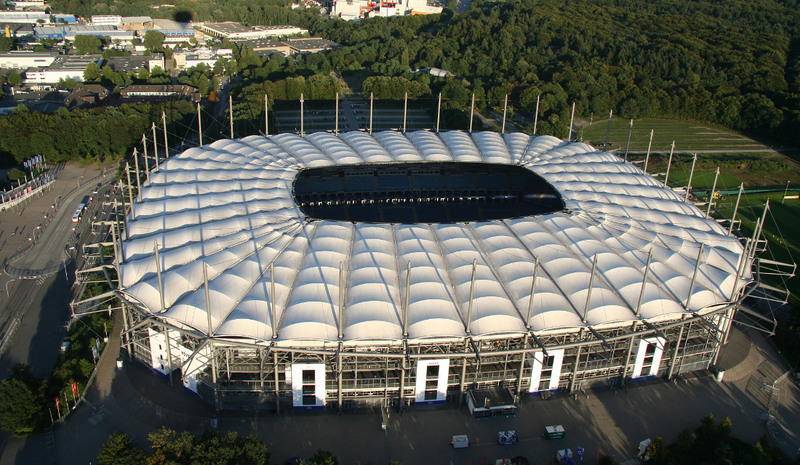 The Volksparkstadion was one of the playing venues of the 2006 World Cup, during which it hosted four group matches and the quarter-final between Italy and Ukraine (3-0). In 2010, the Volksparkstadion hosted the Europa League final between Atlético Madrid and Fulham (2-1). The Volksparkstadion is located in the north-west of Hamburg, slightly more than 7 kilometres from Hamburg’s city centre. The stadium lies just a kilometre away from the A7 motorway (which crosses Hamburg north-south) and is thus easily reached by car. Take the exit Hamburg-Volkspark and follow the signs to the stadium. If using public transport, the stadium is best reached by overground metro (S-Bahn). Stops Stellingen and Eidelstedt both lie reasonably close to the arena, approximately 15 minutes walking. They can be reached with line S3 and S21. Both lines pass Hamburg’s central station and can be taken from several places in the city centre. On matchdays there are shuttle buses that run from station Stellingen to the stadium from about 2 hours before the match. There is also a shuttle service from the farther away Othmarschen station, which is on S-Bahn line S11. The Volksparkstadion lies tucked in between the Volkspark, a cemetery, and an office park. While the Volkspark is pleasant on a nice summer day, there is little around in terms of eating and drinking, which can therefore better be done in Hamburg’s city centre. The Arena Hotel Hamburg is one of the few options you have if you wish to stay close to the Volksparkstadion. It gets good reviews, and has private rooms as well as dorm rooms. Bedpark Stellingen is another basic option. The Mercure Hotel am Volkspark is a mid-range alternative located on the other side of the Volkspark, though is harder to reach by public transport. Click here for an overview of hotels near the Volksparkstadion, and here to explore the options in Hamburg’s city centre. Tickets for HSV matches can be bought online, by phone +49 (0) 40 4155 1887 (HSV Hotline), at the HSV Service Center at the stadium, at the HSV City Store at the Schmiedestraße 2 in Hamburg’s city centre, or at one of the other fanshops and sales outlets. If tickets remain available, these can also be bought at the ticket windows from two hours before the start of the match. 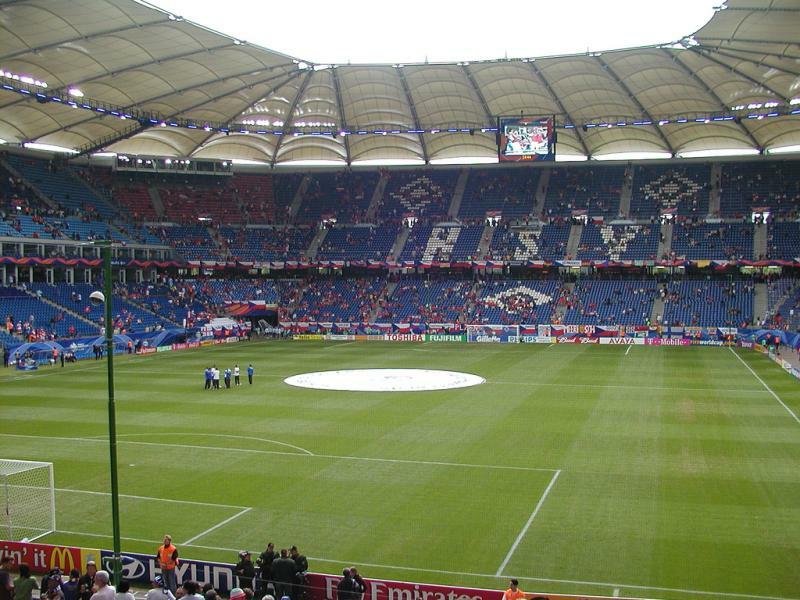 HSV typically sell out 5 to 8 home matches per season. Tickets for most matches are easily available in advance though. HSV matches fall into one of four pricing categories. Tickets for category A+ matches range from €41.00 for an upper-tier seat behind the goal to €95.00 for a lower-tier seat at one of the sides. Tickets for category C matches, the cheapest, range in price between €21.00 and €46.00. Tickets for the standing areas cost €17.00 for all matches. Email info@hsv.de for more information. HSV offer daily guided stadium tours, that include the dressing rooms, VIP areas, the press room, and the mixed zone. The tours last around 75 minutes and can be complemented with a visit to the HSV Museum. Tours run every day of the week two to three times a day and more during school holidays. Check online for an up-to-date schedule. Bookings can be made at the fan shops at the stadium or in the city centre. The tour costs €12.00 including the museum (€6.00 museum only). Call +49 (0) 40 4155 1550 or email museum@hsv.de for more information. HSV.de – Official website of Hamburger SV. Imtech-arena.de – Official website of the Imtech Arena. Hamburg-tourism.de – Hamburg tourist information. HVV.de – Hamburg public transport travel information. I went to watch HSV against Cologne. It was a bottom of the league clash( bottom team beat second from bottom). Very nice stadium. Once you get off the S-bahn there is a 15-minute walk through a park. Tickest very available on the day but i purchased mine about two months in advance and it was delivered to my address in Poland(26 Euros). Very vocal fans from both teams.